The definitive, chronological, and up-to-date guide and trade reading-order on collecting Iron Fist comic books via omnibuses, hardcovers, and trade paperback graphic novels. A part of Crushing Krisis’s Crushing Comics. Last updated November 2018 with titles scheduled for release through March 2019. 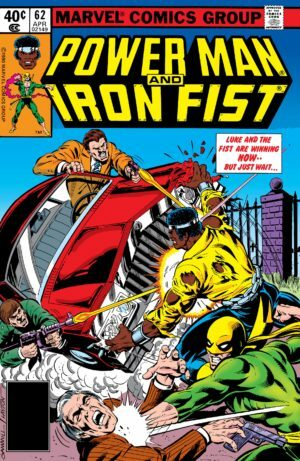 Danny Rand – The Iron Fist – was introduced in 1974 as a whitewashing of the kung fu craze. 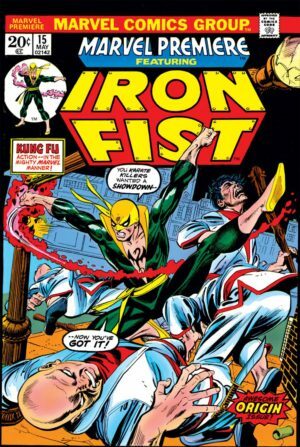 Marvel already had a secret agent Bruce Lee clone in Shangi-Chi starring in Master of Kung Fu and a corresponding magazine in Deadly Hands of Kung Fu, but it was ultimately a genre magazine – but Marvel was all about super heroes, and Iron Fist fit the bill perfectly. 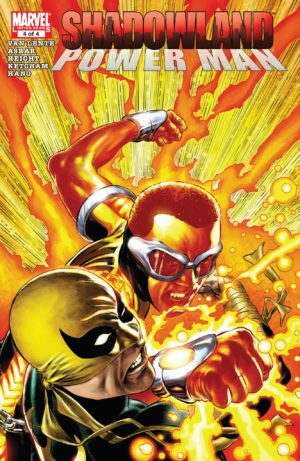 After a short-lived solo series introducing his powers and mythology, Rand joined Luke Cage in to form a duo of unlikely urban heroes for hire in Power Man and Iron Fist in 1978. The juxtaposition of the wealthy Rand and the streetwise Cage made for memorable interactions, even if some of their adventures were forgettable. The result is one of Marvel’s most-remarkable and enduring partnerships. That series ended in 1985 and Danny Rand stayed gone for an impressive seven years before resurfacing in the 90s for a brief stint. It wasn’t until the 2000s, and the onset of creators who grew up with those first two 1970s volumes, that Iron Fist became a major headlining hero in his own right, joining the Avengers and starring in an Eisner-Award-winning solo title. 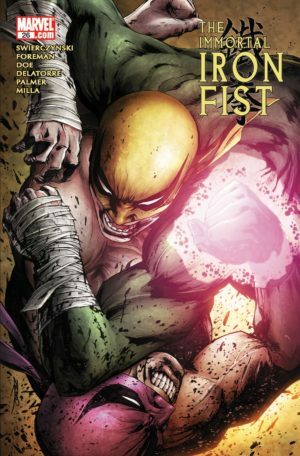 Since then, Iron Fist has become a much more regular feature of Marvel’s publishing line up, with a string of shorter-lived series in Marvel Now and All-New All-Different Marvel – including a return of Power Man and Iron Fist. 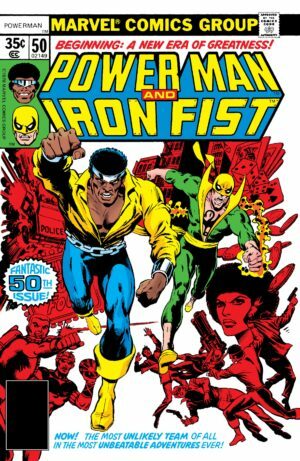 Iron Fist was introduced by Roy Thomas in anthology title Marvel Premiere in 1974, but it was Chris Claremont and John Byrne who took him from the tail-end of that run into his own cult hit title in 1975 and from there to co-star in Power Man – which was quickly revamped to headline both heroes. Marvel consistently treats this material – Marvel Premiere, Iron Fist, and the pair of Team-Up issues – as the “official” story. 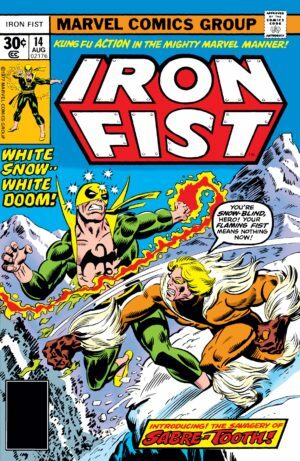 In reality, Iron Fist actually had a few more appearances in this introductory period, which are covered in full below. Marvel Premiere (1972) #15-25, Iron Fist (1975) #1-15, and Marvel Team-Up (1972) #63-64. Reprinted in 2018. Iron Fist made half a dozen additional key appearances in the late 70s. The Kung Fu materials were written by Claremont, but specifically not reprinted due to rights issues with some of the other characters in book – Fu Manchu, in particular. Collects a number of key Gil Kane issues, including The Amazing Spider-Man (1963) #99 & 123, Captain Marvel (1968) #17, Daredevil (1964) #146, Marvel Comics Presents (1988) #116, Marvel Premiere (1972) #1 & 15, Tales of Suspense (1959) #88-91, Tales to Astonish (1959) #76, and What If? (1977) #3. Iron Fist’s origin pads out this final Brubaker/Fraction volume. Also collected in hardcover. Marvel Premiere #17-19: Not collected, except as above. Scheduled to collect #1-18 & Special 1. Iron Fist stars in #18 after Marvel Premiere #25. Marvel Premiere #20-25: Not collected, except as above. Iron Fist (1975) #1-4: In Masterworks, Epic, and Essential, above. Deadly Hands of Kung Fu (1974) #29 & 31-32: In DHoKF Omnibus above. Also, issues #32-33 are an early Daughters of the Dragon and Shang-Chi story and reprinted in the 2014 Deadly Hands of Kung Fu TPB. Iron Fist #5-10: In Masterworks, Epic, and Essential, above. Maybe also The Spectacular Spider-Man (1976) #9? Iron Fist may appear solely in flashback there; I need to check. Iron Fist #11-15: In Masterworks, Epic, and Essential, above. Notably, #14 is the debut of Sabretooth and is collected in Marvel Visionaries: Chris Claremont. Unrelated to that, #15 continues almost directly from Uncanny X-Men #107-108. Marvel Team-Up #63-64: A one-two punch of team-ups with Iron Fist and Daughters of the Dragon. See Spider-Man for collection information. Launched by Chris Claremont, this duo title was swiftly taken over by Mary Jo Duffy for four years before Denny O’Neil took the reigns (fresh from Batman and Green Lantern), and then a young Kurt Busiek before devolving into a hodge-podge of guest writers including Christopher Priest as James Owsley. 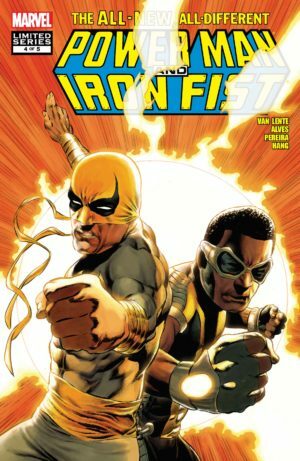 Iron Fist brought an injection of fans and supporting characters to the flagging Luke Cage, and Cage’s status as the first long-running African American superhero was only enhanced by (and inextricably linked to) his association with the blue-blooded Danny Rand. The series was cancelled in 1986 amidst a wave of consolidation of low-selling 70s holdover titles, including The Defenders. Danny Rand was left seemingly dead, but that wasn’t such a big deal – even Luke Cage was effectively put into mothballs until the 1990s. Also includes #49-50. Issue #66 is Sabretooth’s second appearance. Also collects Daredevil #178 (crossover from #76). #73: Not collected. A crossover with ROM #22-23, which has not been reprinted due to rights issues. 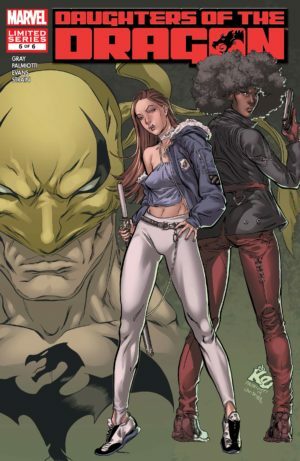 Danny Rand does not appear in the final five issues of this series. 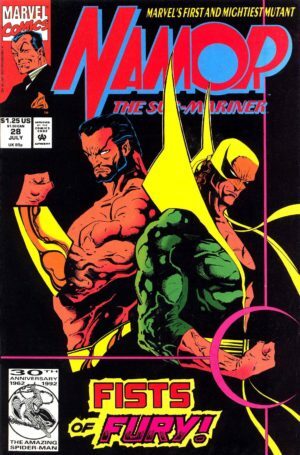 Iron Fist made his return after half-a-decade of presumed death, thanks to one of his original curators, John Byrne – now the writer/artist of Namor! This is reprinted in Silver Surfer: Parable. It’s unclear to me if Iron Fist’s appearance here is in continuity. Collects Iron Fist stories from this guest-starring period. In continuity order, they are – Marvel Comics Presents (1988) 111, 113-118, & 125-132, Namor Annual 3, Marvel Comics Presents #133-137, Spider-Man (1990) #41-43, and Marvel Comics Presents #140-141. 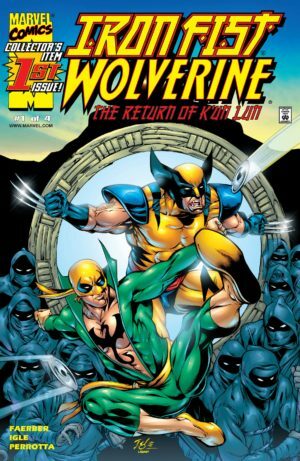 This Epic-sized collection gathers four different series – Iron Fist (1996) #1-2, Iron Fist (1998) #1-3, Iron Fist / Wolverine #1-4, and Iron Fist (2004) #1-6 – plus Iron Fist’s modern origin retelling from Uncanny Origins #14, and material from Marvel Knights Double Shot #4. Daredevil: Cage Match: A one-shot flashback story. Collected with New Avengers: Luke Cage (2010). This may have occurred prior to this volume rather than after it. 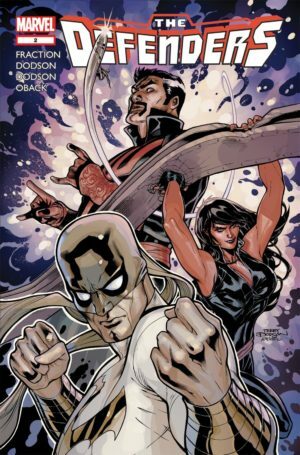 Iron Fist finally merited his own title again, anchoring a new iteration of Heroes for Hire written by John Ostrander. It was launched in Marvel’s wave of new titles in the wake of their Heroes Reborn debacle, but lasted just two years. In the middle of that series, Iron Fist returned for another mini-series penned by Dan Jurgens. Afterwards, he was back to guest star status for a couple of years. This occurs after Heroes for Hire #13 and prior to the Siege of Wundagore crossover. 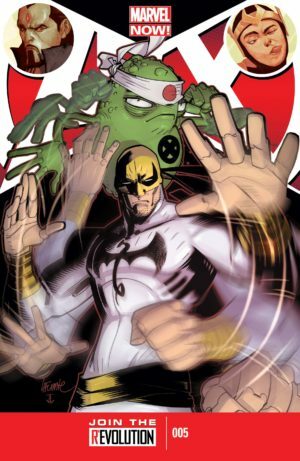 Iron Fist does not appear in Heroes for Hire #14. Heroes for Hire #15-16 & Annual ’98 are part of the “Siege of Wundagore” crossover with Quicksilver, collected here along with #10-13 and #17-19. The reading order is HFH 15, QS 11, HFH 16, QS 12, & HFH Annual ’98. Also collected in Avengers: Quicksilver alongside his complete series. Marvel Knights Double-Shot #4: Collected with The Return of K’un Lun, above. In this period Iron Fist appears semi-regularly in both New Avengers and Daredevil, eventually earns his own ongoing title for the first time since the 1970s! Pulse #14: Unclear of his appearance here, but it’s also in The Complete Collection, above. House of M: See Marvel Universe Events. Iron Fist appears in #2-5. This is a pretty pleasing story that leads into the reformation of Heroes for Hire. In this period, Iron Fist makes some appearances masquerading as Daredevil. Daredevil #82-83, 85, 87: See Daredevil. See directly below for continuity placement. 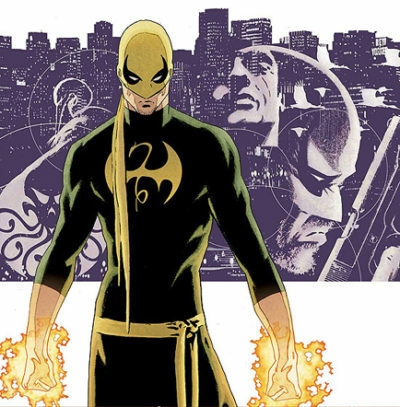 Over 20 years after his first series, Iron Fist finally returned to his own ongoing title. Written in tandem by superstars Ed Brubaker and Matt Fraction, the first half of this run would on to win the Eisner Award for Ed Brubaker as Best Writer in 2008. In this period, Danny Rand also became an Avenger for the first time! His appearances in this era are tightly coordinated between the two books (as well as a number of guest appearances). Collects Immortal Iron Fist #1-16, 8pg Iron Fist story from Civil War: Choosing Sides, Annual #1, Orson Randall and the Green Mist of Death, and The Origin of Danny Rand (maybe framing sequence only?). Order: #1-10, Annual 1, 11-12, Orson Randall & The Green Mist of Death, 13-16, Choosing Sides. Unsure of where the framing sequence is placed. Only #16 falls here in Danny Rand’s chronology; he does not appear in #7 and 15. Collects Immortal Iron Fist #7, #15-16, Orson Randall and the Green Mist of Death, and material from The Origin of Danny Rand. Available in hardcover. Also collects Orson Randall & The Death Queen of California, which does not star Danny Rand. Available in hardcover. Secret Invasion: See Marvel Universe Events. Iron Fist is a supporting character in the main Secret Invasion series, plus other Secret-Invasion-branded titles including Amazing Spider-Man #3 and Front Line #4. Iron Fist does not appear in #21 or 24. Available in hardcover. Placement varies, but this is where this series of one-shots end chronologically. There is a Danny Rand story that runs as a backup in every issue; it is also collected here. The Power Man in question here is the new one introduced in Shadowland. Acts as an intro story to Defenders. Collected with Defenders, below. See Marvel Universe Events: Fear Itself. Iron Fist appears, but this is not essential to his continuity. Iron Fist is a featured hero in this arc battling a reformed Dark Avengers. Defenders (2012) #7-12: See Defenders. Because of the nature of this story (it ultimately retcons itself), it’s best understood as happening all in one chunk. Avengers vs. X-Men: See Marvel Universe Events. 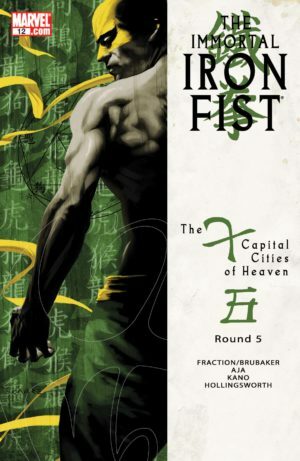 Iron Fist is a featured character in the middle portion of this story along with K’un Lun. He appears throughout the event and its tie-ins, including Avengers vs. X-Men #1-4 & 6-12 and Vs #6, and roughly by chronology in New Avengers #24 & 27, Wolverine and the X-Men #11, Avengers #28, Wolverine and The X-Men #15, New Avengers #30, and Uncanny X-Men #19. Danny Rand’s presence in early Marvel Now – from the end of Avengers vs. X-Men to Infinity – is scant. Aside from a pair of funny Deadpool and Superior Foes issues, he must be off-page managing the Rand Corporation. Age of Ultron: See Marvel Universe Events. Iron Fist appears in #2-3, but this is an alternate timeline which is ultimate rebooted back to the standard Marvel universe. The Superior Foes of Spider-Man (2013) #3-4: A featured player. This is likely Iron Fist’s first post-Infinity appearance. Iron Fist teams up with Luke Cage’s group in this pair of issues. It’s a significant appearance with speaking parts and a fight, though it isn’t crucial to his own continuity. Post-Infinity appearances: Nova (2013) #10, Superior Spider-Man Team-Up (2013) #8, Deadpool #27 (briefly), Wolverine (2014) #8-9, Uncanny Avengers (2012) #17 & 21-22 (alt timeline), Fantastic Four (2014) #6 & 8 (non-speaking in a fight with Avengers), Deadpool (2013) #34, Captain America (2013) #24-25. This series was created entirety by Kaare Andrews – script, linework, and colors! The only duty he didn’t handle with lettering. Author David Walker reassembled this classic team in a dense, amusing book with art from Sanford Greene, a street-level focus, and a major 80s vibe. This Kaare Andrews mini-series was previously announced as a physical ongoing but was delayed and released digitally in favor of the Brisson series. It features a new generation of Iron Fist – a young girl. Due to being set in New York, it like fits in continuity prior to the first arc of the 2017 series (and, also, it was likely written before that story was pitched). 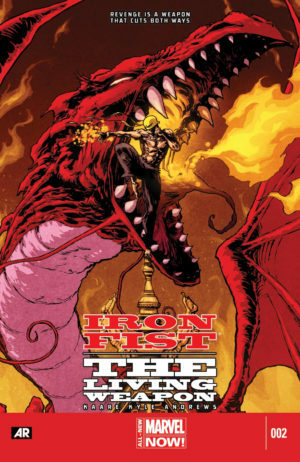 Writer Ed Brisson took Iron Fist’s title back to the vibe of his Immortal series with him entering a mystical martial arts tournament to get back his kung fu mojo. Then, in Marvel Legacy, the series renumbered for a redux of his classic confrontation with Sabretooth (who first appeared in Iron Fist’s 70s series). In this period, Danny also appears throughout Brian Bendis’s Defenders. Though the solicit did not list issue #77, it is included in this book. All three of the non-Daredevil Marvel Netflix heroes were relaunched into digital-first series in the back half of 2018. Collects the six digital-first chapters of this series. Check Amazon for Marvel’s newest Iron Fist titles. 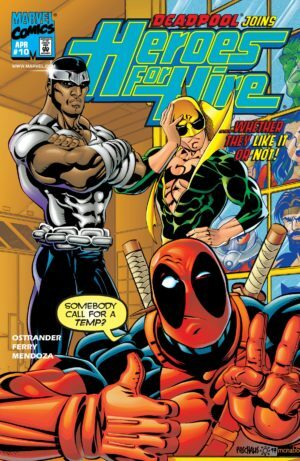 What about Heroes for Hire series from 2011? Good catch! He only appears in #3-5 of that series, and I omitted it by mistake due to having trouble placing it. It’s post Shadowland and pre-Fear Itself, so I think we can safely say it’s probably happening around the same time as Comedy of Death. I just added it there. 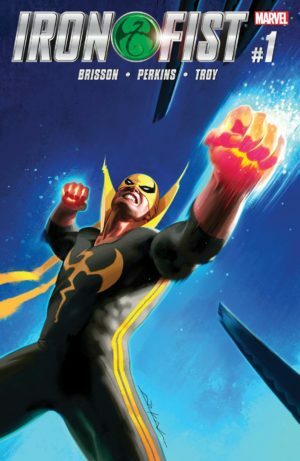 Just to add something that was missed, in the secion Iron Fist in the Heroic Age (2010 – 2012), after the Shadowland Event, there should be an entry for the anthology series “I am an Avenger”. In issue one, there is an 8-page story titled “The Books of the Iron Fist” by Duane Swierczynski with art by Jason Latour, dealing with Misty’s pregnancy. It acts as an epilogue to Swierczynski’s Immortal Iron Fist run, and it includes an editor’s note that it occurs after the Shadowland: Blood on the Streets miniseries. There is a preview here: http://www.cbr.com/i-am-an-avenger-1-2/ and it was collected in the “We are Avengers” TPB. Hey thanks for ruining the fact that Danny dies in the summary. I realize the story is old but it’s like writing a review for a book and saying the main character dies at the end of the book. You’re welcome! This site regularly summarizes comics stories like that one in order to explain how to collect characters and where they’ve disappeared or reappeared. If you’re very sensitive to 30-year-old spoilers then I have to recommend you look elsewhere.